when the sons of God came in unto the daughters of men, and they bare [children] to them, the same [became] mighty men which [were] of old, men of renown. My niece gave me a unique Christmas present; it was a Geno2.0 test kit. The test kit was part of the National Geographic's Genographic project. It consisted of a pretty black box with the outline of a hominid on the front. Inside the box were two small vials, DNA swabs, a booklet on the project, directions on how to take a DNA sample and a return address envelope. The kit costs about $200. I opened my kit with a great deal of enthusiasm. I read the instructions and immediately took out a swab and rubbed it on my inner cheek. I inserted it into a vial and mailed my sample back to National Geographic. Each day I would check on line and watch my sample's progress. The Genographic project people would also send me emails on my sample's progress, but I still felt compelled to check. My DNA sample underwent DNA isolation, analysis, and quality control; all told, it took about three months before I was able to see my test results. My Genographic test revealed information about my distant ancestors. It told me about, how and when, they moved out of Africa and about the various populations with whom they interacted. The Genographic people looked at tracking markers caused by naturally occurring changes in my DNA. It was explained that the changes occurred over thousands of years (on the Y-chromosome for paternal lines and mitochondrial DNA for maternal lines). From these markers, Geneticists were able to figure out from what geographic regions, of the world, my ancestors migrated. There were several things that surprised me. All living human beings can trace their maternal line to a woman designated as K1a9. She lived in Africa, about 180,000 years ago. She was not the only woman alive at that time, but hers, was the only line to survive into current generations. The common paternal ancestor of all men today was born in Africa around 140,000 years ago. He was designated J-L210. He was neither the first human male nor the only human male alive at that time, but he was the only male whose direct lineage is present in our human genome. Genographic let me know that I was one of 580,770 people that have submitted tests to their project. One thing came as a shocker; I discovered that I was 1.9% Neanderthal and 2.4% Denisovan. Scientists say that modern human beings first migrated, out of Africa, around 60,000 years ago. 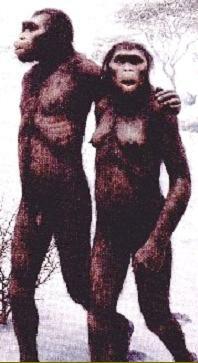 When they got to Eurasia, they discovered other hominid people; people with whom they were able to interbreed. When I mention, to people, that I am 2.4% Denisovan, I will usually get a blank stare. Very little is known about the Denisovans, since their very existence wasn't even suspected until 2008. Russian Archeologists were working at an archeological site, known as the Denisovia Cave, located in the Altai Mountains of Siberia. They uncovered some bone fragments from the fifth finger of a 6-year-old female child. They originally thought that she might be a Neanderthal but after running DNA tests, came to the conclusion that she was an entirely different species. Later, they found adult molars from different individuals and various artifacts including a bracelet. The molars tested out to show that the people were of the same species (or sub species) as the 6-year-old child. DNA tests indicated that the 6-year-old girl had brown hair and brown eyes. Quite a bit is known about Neanderthals, but very little is known about Denisovans. We do know that Melanesians, Australian Aborigines, and other scattered groups in Southeast Asia carry the Denisovan gene. According to various sources, most people from Europe and Asia have some Neanderthal heritage. People of African origin have little or none. We shared the earth with these early people, and yet none of them remain. Neanderthals were stronger, faster and no less smart than modern man. There are indications that they also had the same speech gene that we have. Having this gene suggests that they shared the same language capabilities that we utilize. New evidence, from the Altamira caves in Spain, suggests that some of the cave paintings were of Neanderthal as well as Cro-Magnon origin. Neanderthals made weapons, clothing, had fire, buried their dead and were capable of artistic expression. Why did they and the Denisovans disappear? Could it be that they, like more modern Native Americans, succumbed to diseases that were brought by new humans? Scientists still have no definitive answers on what happened. If you are interested, you can read more about early humans and the Genographic project on their web site: https://genographic.nationalgeographic.com/. Better yet, send them $200 and they will mail you a kit so that you can test your own DNA and see the story of your own ancestry.